When news broke that Johnny Depp would not only cameo in Fantastic Beasts and Where to Find Them but also appear in its sequel, it led to the speculation that he would be playing Grindelwald. A majority of social media were unhappy with this idea, but the die had already been cast. With four more sequels on the way, we know that Grindelwald’s relationship with Dumbledore, who is being cast as we speak, will play a key role in Fantastic Beasts 2. Now there is confirmation that Depp will, in fact, be playing as Grindelwald. Check out the full story below. Fantastic Beasts and Where to Find Them will be the first Harry Potter spinoff to be released since the film series came to an end in 2011. The adventures of the spinoff will continue for at least four more films as Warner Bros announced that Fantastic Beasts will be part one of a five-part series. Announcements like those are not entirely uncommon as studios have a tendency to confirm sequels and larger franchises based on how the film is testing. Another good measurement of success is how well the film tracks, and according to new reports, the Harry Potter-spinoff is on course to have a $75 million opening in the US. Check out the full story below. After the release of eight Harry Potter films, Warner Bros. and J.K. Rowling are now venturing into the wizardry world of spinoff sequels. Fantastic Beasts and Where To Find Them centers on Newt Scamander (Eddie Redmayne), a magizoologist arriving in mid-1920s New York for a brief stop after documenting fantastic beasts around the globe. However, a no-maj (the American version of a muggle) accidentally lets the beasts loose. The studio just held a global fan event where attendees got to see a sneak peek of the upcoming film. But that wasn’t the only surprise. News broke that there will be a total of five Fantastic Beast films that will be released in the future. Check out more on the story below. It’s real easy to see why everyone is excited for another Harry Potter film. Though his story has ended, the franchise will continue to live on through spinoffs and prequels. Fantastic Beasts and Where to Find Them is the first of those films, centering on Newt Scamander (Eddie Redmayne) a Magizoologist of the early 1920s, whose works helped inspire the textbook seen in the first Harry Potter film. Now the film will give us a look at his adventures. But before all of that could happen, Warner Brothers is pleased to announce that they will be holding a free global fan event in 18 major cities around the world. More on the story and a video below. Warner Brothers will be making a few more pushes in the coming weeks to help promote the release of the upcoming Fantastic Beasts and Where to Find Them, and they will start with the final trailer for the film. We’ve known that the Harry Potter spin-off would be based on exploits of Newt Scamander (Eddie Redmayne), the magizoologist whose work was the inspiration for a Hogwart’s textbook that we’ve saw in the original films. Though the character appeared in portraits in the books and films, the prequel-spinoff will be the first time where we see Newt in action. Check out the full trailer for the film here below. After sharing a new poster, the Harry Potter spinoff Fantastic Beasts and Where to Find Them held their panel at San Diego Comic-Con 2016 today. The cast and crew were on hand to discuss the movie and also share a new trailer. Continue below for some of the highlights and to watch the trailer! A new Comic-Con poster has been released for the Harry Potter spinoff Fantastic Beasts and Where to Find Them. 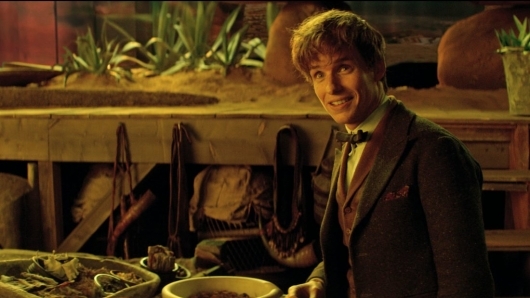 The movie stars Eddie Redmayne as magizoologist Newt Scamander. Also starring is Katherine Waterston, Dan Fogler, Colin Farrell, Alison Sudol, Ezra Miller, Samantha Morton, Jon Voight, Ron Perlman, Carmen Ejogo, Jenn Murray, and Faith Wood-Blagrove. Click on over to the other side to see the new poster and more. The world of Harry Potter continues to expand in more ways than one. 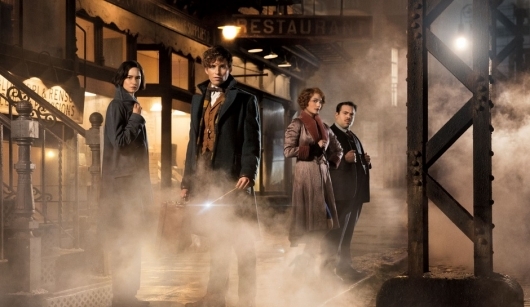 There is the musical, which follows after the events of The Deathly Hallows, and then there’s the upcoming film, Fantastic Beasts and Where to Find Them. 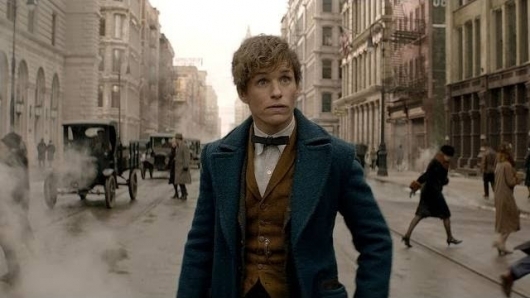 The prequel will take fans back ’70s prior to the events of Harry Potter, where a young magizoologist named Newt Scamander (Eddie Redmayne) ventures across the ocean to America for an important meeting with an official at the Magical Congress of the United States of America. But when creatures escape from the magical briefcase, it is up to Newt and a No-Maj (America’s version of a muggle) to capture them before things turn catastrophic. Now Warner Bros. has released a new featurette that helps familiarize ourselves with our protagonist. Check it out below. A teaser trailer for Fantastic Beasts and Where to Find Them debut during tonight’s MTV Movie Awards 2016, and Warner Bros. has now released it online. Watch the teaser trailer here below. The film is part of J.K. Rowling’s Harry Potter universe and takes place 70 years before the events of the original series. The movie stars Eddie Redmayne as Newt Scamander, a magizoologist — which is someone who studies and catalogs the various magical creatures of the wizarding world — on a trip to New York. With him is a magical suitcase, which you’ll get a glimpse of in this new trailer. Warner Brothers has released a new video in which various Harry Potter cast members and fans of the movie franchise were shown a very special behind the scenes peek at the upcoming prequel spinoff Fantastic Beasts and Where to Find Them and share their reactions to the preview. Hopefully the Fine Brothers won’t attempt to sue Warner Bros. (and us by extension) for this one.